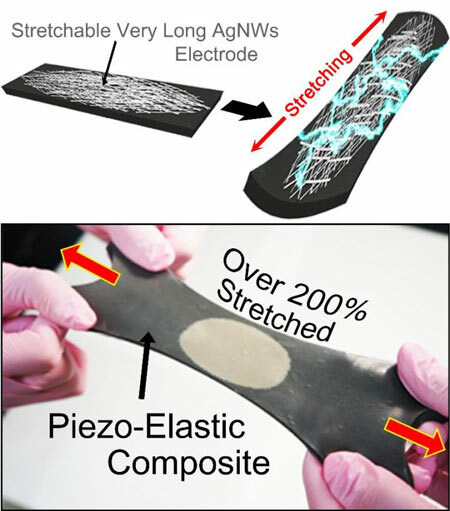 (Nanowerk News) A research team led by Professor Keon Jae Lee of the Department of Materials Science and Engineering at the Korea Advanced Institute of Science and Technology (KAIST) has developed a hyper-stretchable elastic-composite energy harvesting device called a nanogenerator (Advanced Materials, "A Hyper-Stretchable Elastic-Composite Energy Harvester"). Flexible electronics have come into the market and are enabling new technologies like flexible displays in mobile phone, wearable electronics, and the Internet of Things (IoTs). However, is the degree of flexibility enough for most applications? For many flexible devices, elasticity is a very important issue. For example, wearable/biomedical devices and electronic skins (e-skins) should stretch to conform to arbitrarily curved surfaces and moving body parts such as joints, diaphragms, and tendons. They must be able to withstand the repeated and prolonged mechanical stresses of stretching. In particular, the development of elastic energy devices is regarded as critical to establish power supplies in stretchable applications. Although several researchers have explored diverse stretchable electronics, due to the absence of the appropriate device structures and correspondingly electrodes, researchers have not developed ultra-stretchable and fully-reversible energy conversion devices properly. Recently, researchers from KAIST and Seoul National University (SNU) have collaborated and demonstrated a facile methodology to obtain a high-performance and hyper-stretchable elastic-composite generator (SEG) using very long silver nanowire-based stretchable electrodes. Their stretchable piezoelectric generator can harvest mechanical energy to produce high power output (~4 V) with large elasticity (~250%) and excellent durability (over 104 cycles). These noteworthy results were achieved by the non-destructive stress- relaxation ability of the unique electrodes as well as the good piezoelectricity of the device components. The new SEG can be applied to a wide-variety of wearable energy-harvesters to transduce biomechanical-stretching energy from the body (or machines) to electrical energy.